TLRs function as molecular sensors to detect pathogen-derived products and trigger protective responses ranging from secretion of cytokines that increase the resistance of infected cells and chemokines that recruit immune cells to cell death that limits microbe spreading. Viral dsRNA participate in virus-infected cell apoptosis, but the signaling pathway involved remains unclear. In this study we show that synthetic dsRNA induces apoptosis of human breast cancer cells in a TLR3-dependent manner, which involves the molecular adaptor Toll/IL-1R domain-containing adapter inducing IFN-β and type I IFN autocrine signaling, but occurs independently of the dsRNA-activated kinase. Moreover, detailed molecular analysis of dsRNA-induced cell death established the proapoptotic role of IL-1R-associated kinase-4 and NF-κB downstream of TLR3 as well as the activation of the extrinsic caspases. The direct proapoptotic activity of endogenous human TLR3 expressed by cancerous cells reveals a novel aspect of the multiple-faced TLR biology, which may open new clinical prospects for using TLR3 agonists as cytotoxic agents in selected cancers. The recently identified TLR family consists of a germline-encoded set of molecules thought to be critically involved in the detection of pathogens and the triggering of an immune response against microbial infections (1). Ligation of TLRs by their respective ligands triggers well-characterized signaling cascades that result in activation of downstream effectors, such as NF-κB, p38, JNK, and IFN regulatory factors (IRFs)4 (2); resistance against pathogens (3); and, occasionally, cell death (4), which is another way of protecting the host against microbe spreading (5). Such proapoptotic properties have indeed been demonstrated for TLR2 and TLR4, which can induce apoptosis in macrophages through signaling via the molecular adaptor MyD88 and the extrinsic Fas-associated death domain-caspase 8 pathway (4, 6) or via Toll/IL-1R domain-containing adapter inducing IFN-β (TRIF) and the mitochondrial death pathway (7), respectively. Moreover, TRIF by itself exhibits proapoptotic properties (8, 9, 10), thereby strengthening the link between TLR signaling and cell death. Double-stranded RNA, which represents either genomic or life cycle intermediate material of many viruses, activates cells through binding to the dsRNA-dependent protein kinase (PKR), a kinase that initiates a complex molecular antiviral program (11). Recently, dsRNA was also shown to be a ligand for TLR3 that triggers the production of type I IFN (12) Moreover, dsRNA has been reported to induce apoptosis in several cell types, apparently through multiple pathways. For instance, dsRNA transfected in pancreatic β-cells induces PKR- and caspase-dependent apoptosis (13, 14), whereas endothelial cell apoptosis triggered by exogenous dsRNA is mostly dependent on the extrinsic caspase pathway (15). However, no direct evidence has yet been presented regarding the role of TLR3 in dsRNA-induced apoptosis. TLR3 agonists have been used in the past, with variable efficiency, as an adjuvant to treat cancer patients, with the aim of inducing an IFN-mediated anticancer immune response (16, 17). Recent studies in mouse models have highlighted the adjuvant role of dsRNA in tumor vaccination, most notably through the promotion of Ag cross-presentation by dendritic cells and the induction of enhanced primary and memory CD8+ T cell responses (18, 19) However, because TLR3 is also expressed on nonimmune cells, such as keratinocytes (20) or endothelial cells (15), the question of a putative expression and role of this receptor in tumor cells needs to be investigated. In this study we have studied the effects of synthetic dsRNA on cancer cell survival and dissected the TLR3-dependent signaling pathways that can drive those cells to apoptosis. Human breast tumor cell lines (Cama-1, SW527, BT-483, and MCF-7) were obtained from the American Type Culture Collection and cultured in DMEM/Ham’s F-12 medium containing 4.5 g/ml glucose (Invitrogen Life Technologies) complemented with 2 mM l-glutamine (Invitrogen Life Technologies), 10% FCS (Invitrogen Life Technologies), 160 μg/ml gentalline (Schering Plough), 2.5 mg/ml sodium bicarbonate (Invitrogen Life Technologies), amino acids (Invitrogen Life Technologies), and 1 mM sodium pyruvate (Sigma-Aldrich; referred to as complete medium). Polyinosinic-polycytidilic acid (poly(I:C)) was obtained from InvivoGen. Peptidoglycan and LPS were purchased from Sigma-Aldrich. Type I IFNR-blocking mAb was purchased from PBL Biochemical Laboratories, and TNF-α-neutralizing mAb was obtained from Genzyme. Abs to Stat-1, phosphorylated Stat-1 (Tyr701), and PKR were purchased from Cell Signaling Technology. Abs to human IFN-β were obtained from R&D Systems, and Abs to NF-κB p65 subunit, TNFR-associated factor 6 (TRAF6), and β-tubulin were purchased from Santa Cruz Biotechnology. The general caspase inhibitor z-Val-Ala-Asp(OMe)-fluoromethyl ketone (z-VAD-fmk) was purchased from R&D Systems, and cycloheximide (CHX) was obtained from Sigma-Aldrich. Human primary breast tumor samples were obtained from the Centre Léon Bérard in agreement with the hospital’s bioethical protocols. Single-cell suspensions were obtained after digestion with collagenase A (Sigma-Aldrich) and enrichment in human epithelial Ag (HEA)-positive cells using HEA microbeads (Miltenyi Biotec) according to the manufacturer’s instructions. The final single-cell suspension contained >80% HEA-positive cells and <2% CD45+ hemopoietic contaminants. Cell recovery after treatment with TLR ligands was measured by crystal violet staining (Sigma-Aldrich). Cells were plated at 104 cells/well in 96-well plates, and after 72-h culture with or without TLR ligand, cells were washed with PBS, fixed in 6% formaldehyde (Sigma-Aldrich) for 20 min, washed twice, and stained with 0.1% crystal violet for 10 min. After washes and incubation in 1% SDS for 1 h, absorbance was read at 605 nm on a Vmax plate reader (Molecular Devices). Annexin V staining was performed with an AnnexinFITC apoptosis detection kit (BD Pharmingen) according to the manufacturer’s instructions. Subdiploid cells were detected by staining with 3 μg/ml propidium iodide (PI; Molecular Probes) after overnight permeabilization in 70% ethanol. Fluorescence was analyzed by flow cytometry on a FACSCalibur (BD Biosciences) equipped with a doublet-discrimination module using CellQuest Pro software (BD Biosciences). Cama-1 cell proliferation was analyzed with the anti-BrdU FITC-conjugated Ab set (BD Pharmingen) after a 1-h pulse with 10 μg/ml BrdU (Sigma-Aldrich) according to the manufacturer’s instructions. Production of IL-6 by Cama-1 was assessed in culture supernatants with the DuoSet ELISA kit (R&D Systems) according to the manufacturer’s instructions. Cama-1 cells were lysed in 1% Nonidet P-40-containing buffer, and 20 μg of total proteins were loaded per lane on SDS-polyacrylamide gels (Invitrogen Life Technologies). Western blots (WB) were performed with standard techniques using the Abs described above. Cama-1 cells were plated in six-well plates at 3 × 105 cells/well. After overnight adherence, siRNA transfections were performed for 5 h in OptiMEM medium (Invitrogen Life Technologies) containing 3 μg/ml Lipofectamine 2000 (InvivoGen) and 100 nM siRNA. Cells were then washed and cultured for 72 h in complete medium before treatment with poly(I:C) and apoptosis analysis. The siRNA duplexes specific for TLR3, PKR, and p65 were purchased from Dharmacon as SMART-Pools. TRIF and control scrambled siRNA were purchased from the same supplier as single oligoduplexes (5′-GCUCUUGUAUCUGAAGCAC-3′ and 5′-ACUAGUUCACGAGUCACCU-3′, respectively). TLR3 and TRIF expressions were assessed by PCR (35 cycles of 1 min at 94°C, 1 min at 55°C, and 2 min at 72°C) with Taq PCR ReadyMix (Sigma-Aldrich) using the following primers: 5′-AACGATTCCTTTGCTTGGCTTC-3′ (forward)/5′-GCTTAGATCCAGAATGGTCAAG-3′(reverse) for TLR3 and 5′-ACTTCCTAGCGCCTTCGACA-3′ (forward)/5′-ATCTTCTACAGAAAGTTGGA-3′ (reverse) for TRIF. The expressions of PKR and p65 were assessed by WB as described above. Statistical significance was assessed with two-tailed Student’s t test, and results are given as the mean ± SD. To investigate the role of TLR3 agonists on tumor cells, human breast adenocarcinoma cell lines were cultured with 50 μg/ml of the dsRNA analog poly(I:C) for 72 h. Three of four cell lines tested (Cama-1, BT-483, and SW527, but not MCF-7) showed a significant decrease in cell recovery, as measured by crystal violet staining, with Cama-1 consistently exhibiting the most dramatic drop (Fig. 1⇓a). Nevertheless, the polyI:C-induced decrease in cell recovery of BT483 and SW527, although weaker than that in CAMA-1 cells, was both significant (35 and 25%, respectively, compared with <3% in controls) and highly reproducible (at least three times). The decrease in recovery of Cama-1 cells was due to apoptosis, as illustrated by annexin V staining (Fig. 1⇓b). Poly(I:C) triggered significant dose-dependent apoptosis in the Cama-1 cell line, starting at 9 h and reaching a level of 80% apoptotic cells after 30 h of treatment (Fig. 1⇓c). Cell recovery decrease was associated with an increase in subdiploid cells, as illustrated by PI staining (Fig. 1⇓d). When added at 50 μg/ml to Cama-1 cell culture, the dsRNA analog polyadenylic-polyuridylic acid (poly(A:U)) triggered similar cell death, although with slower kinetics (Fig. 1⇓e). Importantly, one of two human primary breast tumor cell samples exposed for 48 h to 50 μg/ml poly(I:C) underwent a 2-fold increase in apoptosis, as illustrated by PI (Fig. 1⇓f) and annexin (data not shown) staining. A nonspecific proapoptotic effect of our TLR3 agonists preparations was excluded by the absence of toxicity in MCF-7 breast cancer cells (Fig. 1⇓a) and in four non-small cell lung and colon cancer cell lines as well as in TLR3-transfected 293 cells (data not shown). Collectively, these results demonstrate that TLR3 agonists are able to directly and in a dose-dependent manner trigger the apoptosis of breast tumor cells. Synthetic dsRNA induces TLR3- and TRIF-dependent apoptosis of human breast tumor cells. a, Breast tumor cell recovery after culture with poly(I:C) is expressed as a percentage, with cultures in medium alone considered 100%. The data shown were obtained from three independent experiments conducted in triplicate. The star indicates a statistical difference from respective controls (p < 0.05). b, Cama-1 cells were cultured for 24 h without (gray) or with (white) poly(I:C), and apoptosis was measured by annexin V staining. c, Cama-1 cells were cultured without (▵) or with increasing doses of poly(I:C) (□, 0.5 ng/ml; ○, 5 ng/ml; ▴, 50 ng/ml; ▪, 500 ng/ml; •, 5 μg/ml), and the percentage of annexin V-positive apoptotic cells was measured at the indicated time points. Data shown are representative of three independent experiments with similar results. d, Cama-1 cells were cultured without (PBS) or with poly(I:C), and DNA content was measured by PI staining. The percentage indicates the proportion of subdiploid cells in cultures. e, Cama-1 cells were cultured for 24 or 48 h without (▦) or with (▪) poly(A:U). Annexin V-positive apoptotic cells are expressed as a percentage of the total cells in culture. Data shown were obtained from three independent experiments. f, Freshly recovered breast tumor cells were cultured in medium without (PBS) or with poly(I:C), and cell DNA content was measured by PI staining. Percentages indicate the proportion of cells with low DNA content (subdiploid cells), i.e., apoptotic cells. PKR can be triggered by synthetic transfected dsRNA (21), whereas TLR3 can be triggered by exogenous poly(I:C) (22). To determine whether PKR or TLR3 was involved in dsRNA-induced Cama-1 cells apoptosis, the expression of each protein was efficiently suppressed through transfection of specific siRNAs (Fig. 2⇓a). Interestingly, although TLR3 mRNA was not readily detected in the steady state in either Cama-1 cells or the other cell lines studied, and the level of TLR3 mRNA, as evaluated by PCR, was not directly linked to the apoptotic response to poly(I:C) in the four lines analyzed (Fig. 2⇓a and data not shown), poly(I:C) treatment induced strong TLR3 mRNA up-regulation in Cama-1 cells (Fig. 2⇓a, left panel). 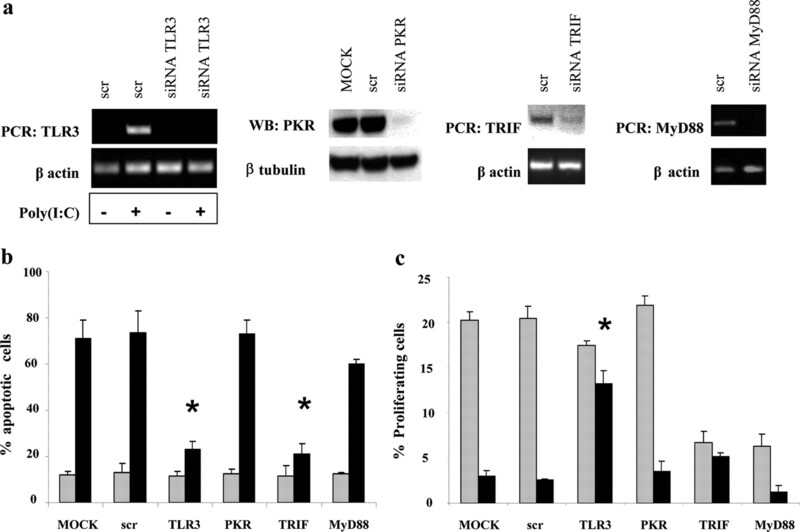 Suppression of TLR3 with specific siRNA virtually abrogated poly(I:C)-induced apoptosis, whereas cell death occurred normally in the almost complete absence of PKR (Fig. 2⇓b). The serine/threonine protein kinase inhibitor 2-aminopurine had no effect on poly(I:C)-induced apoptosis (data not shown), confirming the lack of PKR involvement. Although the involvement of MyD88 in TLR3 signaling remains controversial, TRIF is the critical adaptor protein for TLR3 from which signaling diverges. On the one hand, the recruitment of TRAF6 and receptor-interacting protein 1 by TRIF leads to the activation of NF-κB, JNK, and p38. In contrast, recruitment and activation of TRAF family member-associated NF-κB activator binding kinase drive the nuclear translocation of IRF-3 and the production of type I IFN (1, 23, 24). Accordingly, suppression of TRIF, but not MyD88, with specific siRNA significantly reduced poly(I:C)-induced apoptosis of Cama-1 cells (Fig. 2⇓b). Double-stranded RNA not only induced apoptosis, but also blocked the proliferation of Cama-1 cells, as measured by BrdU incorporation (Fig. 2⇓c). The siRNA experiments showed that, like apoptosis, the cytostatic effect of poly(I:C) was mediated by TLR3, but was independent of PKR. Of note, inhibition of TRIF or MyD88 expression by itself decreased BrdU incorporation (Fig. 2⇓c), suggesting a role for these molecules in Cama-1 cell proliferation. Taken together, these data demonstrate that synthetic dsRNA both induces the apoptosis and blocks the proliferation of breast cancer Cama-1 cells in a TLR3- and TRIF-dependent manner, which involves neither PKR nor MyD88. Poly(I:C) induces TLR3- and TRIF-dependent, but PKR- and MyD88-independent, apoptosis of human breast tumor cells. a, Cama-1 cells were collected after siRNA transfection and culture without or with poly(I:C). RNA was PCR amplified for TLR3, TRIF, and MyD88 expression assessment, whereas PKR protein expression was analyzed by WB on cell lysates. β-Actin RNA and β-tubulin protein were used as loading controls. b, Cama-1 cells transfected with the indicated siRNA or with scrambled control duplex (scr) were cultured 24 h without (▦) or with (▪) poly(I:C). Annexin V-positive apoptotic cells are expressed as a percentage of the total cells in culture. Data shown were obtained from three independent experiments. The star indicates a statistical difference from respective controls (p = 0.001). c, Cama-1 cells were pulsed for 1 h with BrdU after siRNA transfection and subsequent 24-h culture without (▦) or with (▪) 5 μg/ml poly(I:C), and cellular proliferation was analyzed as described in Materials and Methods. Proliferating cells are expressed as a percentage of the total cells in culture. Data shown were obtained from three independent experiments, and the star indicates statistical difference from controls (p < 0.02). Because TRIF adapter is known to mediate the type I IFN response of TLR3 (23), the role of type I IFN in TLR3- and TRIF-mediated apoptosis was evaluated. IFN-β production was strongly induced upon poly(I:C) treatment, and Stat1 phosphorylation was observed, indicative of type I IFN signaling (Fig. 3⇓a). Of note, the very sensitive detection of Stat1 phosphorylation was maximum after 6 h of poly(I:C) treatment, when IFN-β production was still hardly detectable by WB. Neutralization of type I IFNR with specific mAb significantly reduced poly(I:C)-induced apoptosis (Fig. 3⇓b), demonstrating that type I IFNs were necessary for TLR3-mediated cell death. However, treatment of Cama-1 cells with a mixture of IFN-α and IFN-β did not induce apoptosis (Fig. 3⇓b), whereas it sensitized other breast cancer cells to apoptosis, thereby demonstrating its biological activity (B. Salaun and S. J. Lebecque, manuscript in preparation). These results establish that type I IFN signaling is required for TLR3-triggered cytotoxicity, although it is insufficient to induce cell death by itself. Therefore, type I IFN- and additional TLR3-triggered signaling pathways appear to cooperate to trigger Cama-1 cells apoptosis. TLR3-induced apoptosis requires type I IFN. a, IFN-β and Stat-1 protein levels and Stat1 phosphorylation measured by WB in lysates of Cama-1 cells cultured with poly(I:C) for the indicated time periods. β-Tubulin is shown as a loading control. b, Cama-1 cells untreated or preincubated for 1 h with either neutralizing IFN type I receptor mAb (anti-IFN R1) or isotype control (mIgG1) were cultured without (▦) or with (▪) poly(I:C) or a mixture of IFN-α and IFN-β (□). Annexin V-positive apoptotic cells are expressed as a percentage of the total cells in culture. Data shown were obtained from two independent experiments. The star indicates a statistical difference from respective controls (p < 0.02). Beside type I IFN production, TLR3 has also been shown to trigger TRIF-mediated NF-κB activation (12). IRAKs are central to TLR signaling and are known to induce I-κB degradation through TRAF6 recruitment and subsequent activation of the I-κB kinase complex (2). However, the roles of IRAK-4 and TRAF6 in TLR3 signaling remain unclear. The siRNAs specific for each molecule efficiently suppressed the expression of the respective protein in Cama-1 cells (Fig. 4⇓a). Double-stranded RNA-induced IL-6 secretion, which is mediated by TLR3 (Fig. 4⇓b), was significantly reduced in the absence of either IRAK-4 or TRAF6 expression. Unexpectedly, IRAK-4, but not TRAF6, suppression prevented poly(I:C)-triggered and TLR3-mediated apoptosis (Fig. 4⇓c). Incidentally, the very low secretion of IL-6 by Cama-1 cells not exposed to poly(I:C) indicated that siRNA did not significantly activate TLR3. Taken together, these results indicate that both IRAK-4 and TRAF6 participate in the endogenous TLR3 signaling in Cama-1 cells and reveal an unsuspected pathway, downstream of TLR3, that involves IRAK-4, but not TRAF6, and leads to cell death. TLR3-induced apoptosis requires IRAK-4, but not TRAF6, whereas both IRAK-4 and TRAF6 are involved in TLR3-mediated IL-6 secretion in Cama-1 cells. a, Cama-1 cells were collected after transfection with siRNA specific to either IRAK-4 or TRAF6, and the expression of the corresponding protein was assessed by WB. β-Tubulin is shown as a loading control. n.s., nonspecific band. 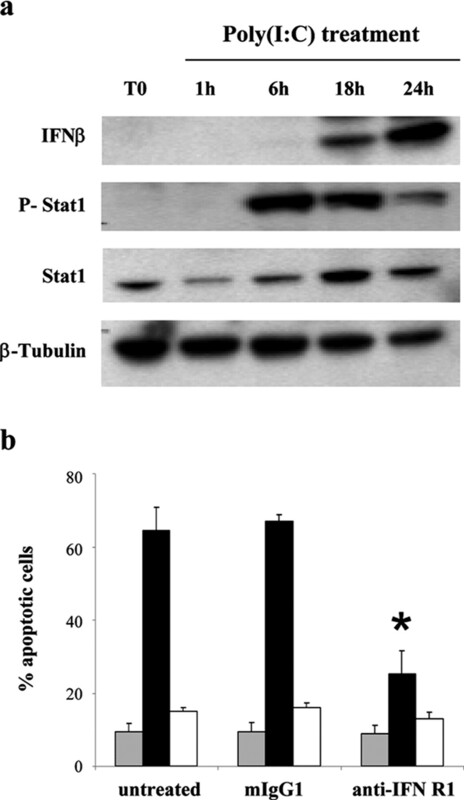 b, IL-6 secretion by Cama-1 cells was measured in culture supernatants after siRNA transfection and subsequent 24-h culture without (▦) or with 5 μg/ml poly(I:C). Data shown were obtained from two independent experiments. The star indicates a statistical difference from respective controls (p < 0.01). c, After similar treatment as in b, apoptosis induction by poly(I:C) was analyzed by annexin V staining and is expressed as a percentage of the apoptotic cells in the culture. Data shown were obtained from three independent experiments. The star indicates a statistical difference from respective controls (p < 0.01). An autocrine effect of TNF-α has previously been implicated in the apoptotic activity of TLR4 ligand in human alveolar macrophages (25). This cytokine plays no role in TLR3-mediated apoptosis, because neutralizing anti-TNF-α Ab, which protects Cama-1 cells from TNF-α-induced apoptosis, has no effect on poly(I:C)-triggered cell death (Fig. 5⇓a). The general transcriptional inhibitor CHX is known to sensitize cells to TNF-α-induced apoptosis by blocking the NF-κB-controlled survival program (26). As expected, pretreatment with CHX significantly sensitized Cama-1 cells to TNF-α-induced cytotoxicity (Fig. 5⇓a). In contrast, it partially protected the cells against poly(I:C)-triggered apoptosis, confirming that different mechanisms were triggered by these two proapoptotic stimuli. Indeed, inhibition of NF-κB p65 expression by specific siRNA (Fig. 5⇓b) protected Cama-1 cells against poly(I:C)-induced apoptosis (Fig. 5⇓c). Collectively, these results demonstrate that TNF-α secretion is not responsible for poly(I:C)-induced apoptosis and establish a proapoptotic role of NF-κB in TLR3-mediated apoptosis that contrasts with its antiapoptotic function upon TNF treatment. TLR3-triggered Cama-1 apoptosis is independent of TNF-α, but requires protein synthesis and NF-κB. a, Cama-1 cells, untreated or preincubated with either neutralizing anti TNF-α mAb or CHX, were cultured without (▦) or with poly(I:C) (▪) or TNF-α (□). Annexin V-positive apoptotic cells are expressed as a percentage of the total cells in culture. The data shown were obtained from two independent experiments. The star indicates a statistical difference from respective controls (p < 0.01). b, Cama-1 cells were collected after siRNA transfection, and NF-κB p65 protein expression was determined by WB. β-Tubulin is shown as the loading control. c, Cama-1 cells, either mock-transfected or transfected with siRNA specific for p65 or scrambled control duplex (scr), were cultured without (▦) or with (▪) poly(I:C). Results are expressed as the percentage of annexin-positive apoptotic cells in culture. Data shown were obtained from three independent experiments. The star indicates a statistical difference from mock-transfected controls (p < 0.005). The role of caspases in poly(I:C)-induced cell death was analyzed. 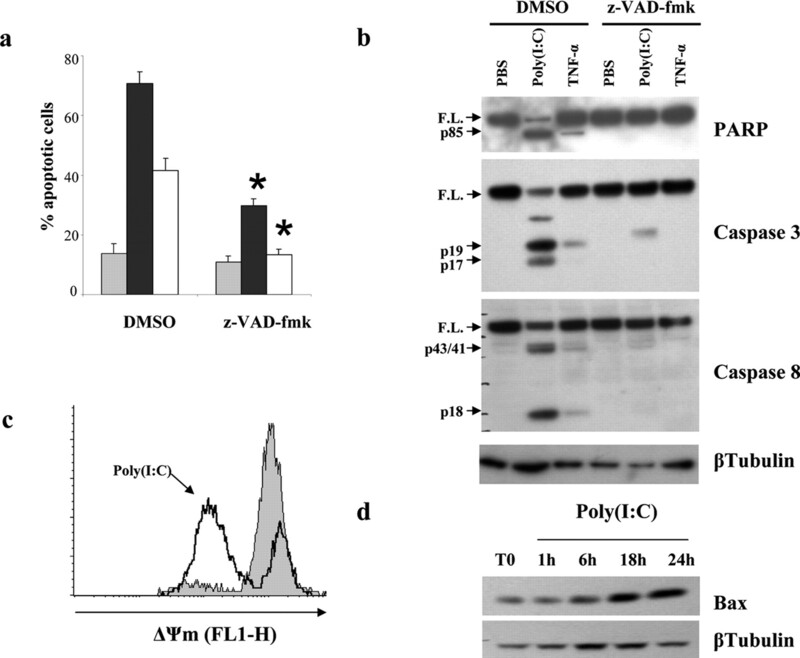 The broad caspase inhibitor, z-VAD-fmk, which inhibited TNF-α-induced cell death, also greatly reduced poly(I:C)-triggered apoptosis, suggesting a major role for caspases in TLR3-mediated cytotoxicity (Fig. 6⇓a). Poly(ADP-ribose) polymerase (PARP) cleavage, a hallmark of caspase-dependent apoptosis, occurred in Cama-1 cells upon poly(I:C) treatment (Fig. 6⇓b, top panel), confirming the involvement of caspases in TLR3-mediated apoptosis. Caspase 3 was indeed activated upon poly(I:C) treatment, as demonstrated by WB analysis (Fig. 6⇓b, middle panel). Interestingly, caspase 8 also was activated by poly(I:C) (Fig. 6⇓b, lower panel), reminiscent of the apoptosis triggered by TRIF overexpression (10), and the caspase 8-specific inhibitor z-IETD prevented the apoptosis (data not shown). TLR3-mediated apoptosis is dependent on extrinsic caspase activation. a, Cama-1 cells were preincubated with the general caspase inhibitor z-VAD-fmk or DMSO (used as control) before culture without (▦) or with (▪) poly(I:C) or TNF-α (□). Results are expressed as a percentage of the annexin-positive apoptotic cells in culture. Data shown were obtained from three independent experiments. The star indicates a statistical difference from respective controls (p < 0.0001). b, Lysates from Cama-1 cells, obtained as described in a, were analyzed by WB with mAb specific for poly(ADP-ribose) polymerase (PARP; top panel), caspase 3 (middle panel), and caspase 8 (lower panel). F.L., full length; p85, cleaved PARP; p17 and p19, cleaved caspase 3; p43/41 and p18, cleaved caspase 8. β-Tubulin is shown as a loading control. c, Cama-1 cells cultured without (▦) or with poly(I:C) (□) were incubated with 3,3′-dihexyloxacarbocyamine iodide (3 ), and accumulation of the dye that depends on mitochondrial transmembrane potential was determined by flow cytometry. d, Bax protein level measured by WB in lysates of Cama-1 cells cultured with poly(I:C) for the indicated time periods. β-Tubulin is shown as the loading control. The low levels of activated caspases 3 and 8 still present after z-VAD-fmk pretreatment and poly(I:C) stimulation may be responsible for the residual apoptosis observed by annexin staining, although the involvement of a caspase-independent apoptotic pathway remains a possibility. Caspase 9 activation could not be detected (data not shown), although poly(I:C) triggered a sharp decrease in mitochondrial membrane potential, as measured by 3,3′-dihexyloxacarbocyamine iodide (3) staining (Fig. 6⇑c), and a clear up-regulation of the proapoptotic Bax protein (Fig. 6⇑d). Taken together, these results demonstrate the dominant role of the extrinsic apoptotic pathway (shared with death receptors such as TNFR, Fas, and TRAIL) in poly(I:C)-triggered apoptosis, although some participation of the intrinsic pathway could not be completely excluded (27). Although involvement of TLR3 in apoptosis has recently been suggested (9, 10, 28), direct demonstration of the participation of this receptor in cancer cell apoptosis is lacking. The present work demonstrates the role of TLR3 in triggering breast cancer cell apoptosis via the adaptor TRIF, independently of PKR and MyD88. In addition to TLR3 and PKR, the RNA helicase retinoic acid-inducible gene 1 (RIG-1) was recently described to initiate a cellular response to dsRNA (29). However, TLR3 and RIG-1 are reported to trigger nonoverlapping signaling pathways. Therefore, given the almost complete protection provided by either TLR3 or TRIF siRNAs in Cama-1 cells, it is unlikely that RIG-1 plays an important role in dsRNA-induced apoptosis. Molecular events involved in cell death induced by TLR3 agonists include the production of type I IFN, which is required, but not sufficient, for apoptosis. NF-κB p65 and extrinsic caspases are activated by TLR3 engagement and are also necessary for TLR3-mediated apoptosis. Regarding the signaling pathway, we demonstrate in this study that IRAK-4 and TRAF6 are involved in TLR3-triggered IL-6 production by Cama-1 cells. Although transfection-based studies have excluded IRAK-4 from TLR3-triggered signaling cascade (30), our data are in agreement with reports demonstrating that the lack of IRAK-4 expression deeply affects the response to dsRNA in both mice (31) and humans (32). Poly(I:C)-induced cell death also reveals a pathway downstream of TLR3 that signals through IRAK-4 even in the absence of TRAF6. Similar to our findings, a branching point downstream of IRAK kinases has been described for TLR4, where proapoptotic and NF-κB signalizations were shown to diverge after IRAK-1 activation (33). However, several steps along the proapoptotic signaling pathway induced by TLR3 remain to be clarified. Indeed, it is unclear whether the early recognition of dsRNA is mediated by the low level of TLR3 expressed on resting cells or by another receptor. Elucidating the exact contribution of IFNRI signaling (known to activate the extrinsic caspases (34)) and analyzing the putative roles of proteins such as TBK1, IRF-3, and RIP1, which all participate in TLR3 signaling (35) will also require additional investigations. Type I IFNs involvement is reminiscent of the toxicity of the combination of dsRNA and type I IFNs for many cell types (36) and of the essential role these cytokines play in PKR-independent, virus-induced, apoptotic cell death (37). Regarding the mechanisms of action, the partial inhibition of dsRNA-induced apoptosis by the protein synthesis general inhibitor CHX shows that type I IFNs do not participate in TLR3-triggered cell death simply by down-regulating protein synthesis through PKR-induced phosphorylation of eukaryotic initiation factor2α. Alternatively, type I IFNs can facilitate apoptosis in various cell types by up-regulating the expression of proteins directly involved in cell death, including caspases (38), TRAIL, and p53 (39). Furthermore, IFN-α induces the expression of multiple genes that increase and accelerate the response to dsRNA, including PKR, 2′5′-oligoadenylate synthetase, IRF-3, and TLR3 (15). Lastly, in contrasts with its survival role after TLR2 (40) and TLR4 (7) triggering, NF-κB appears to be required for TLR3-induced apoptosis. It remains to be established whether the p65 subunit of NF-κB is involved in the up-regulation of TLR3 or IFN-I expression or in other pathways that link TLR3 triggering to apoptosis. Finally, not every breast cancer cell line we tested was killed by poly(I:C), and there was no simple correlation between TLR3 expression in the resting state and poly(I:C)-induced apoptosis in the breast cancer cell lines tested in vitro. Defects in the cellular apoptotic machinery may explain the resistance to TLR3 agonists of cells such as MCF-7, which lack functional caspase 3 (41). Alternatively, differences in subcellular localization of the receptor or the ability to produce and/or respond to type I IFN after TLR3 stimulation may account for the variation in sensitivity observed in vitro. Both poly(I:C) and poly(A:U) have been used with moderate success as adjuvant therapy in clinical trials for different types of cancer, including adenocarcinomas of the breast (42). Although the initial goal had been to trigger an innate immune response against cancer cells, the above data suggest that TLR3 agonists might have a direct proapoptotic effect on tumor cells. Indeed, retrospective immunostaining of breast tumor biopsies has shown that only patients with TLR3+ breast cancer had a prolonged survival after receiving poly(A:U) vs placebo (43, 44). Those results support a direct effect of TLR3 agonist on cancer cells that is compatible with our in vitro data and that, in contrast to other reports of TLR-triggered apoptosis, does not require simultaneous inhibition of transcription, translation, or proteasomal degradation (9, 28, 33). Importantly, although we could not obtain primary normal breast cells for in vitro study, the lack of breast side effects in patients receiving TLR3 agonist after surgical removal of their tumor (16) is encouraging considering the possible toxicity of such treatment on nontransformed breast epithelial cells. To conclude, the present data open a new range of therapeutic applications for TLR3 agonists as cytotoxic agents in selected cancers and raise the exciting concept of multifunctional adjuvants that are able to both directly kill the tumor and enhance the host’s immune response against it. We gratefully thank Jean-Yves Blay and Christine Caux-Ménétrier for providing fresh tumor samples, Jean-Jacques Pin for invaluable technical help, and Sem Saeland and Blandine de Saint-Vis for critical reading of the manuscript. ↵1 B.S. and I.C. were supported by a Foundation Marcel Mérieux fellowship. ↵2 B.S. and I.C. contributed equally. ↵4 Abbreviations used in this paper: IRF, IFN regulatory factor; CHX, cycloheximide; HEA, human epithelial Ag; IRAK, IL-1R-associated kinase; PARP, poly(ADP-ribose)polymerase; PI, propidium iodide; PKR, dsRNA-dependent protein kinase; poly(A:U), polyadenylic-polyuridylic acid; poly(I:C), polyriboinosinic-polyribocytidylic acid; RIG-1, retinoic acid-inducible gene 1; siRNA, small interfering RNA; TRAF6, TNFR-associated factor 6; TRIF, Toll/IL-1R domain-containing adapter inducing IFN-β; WB, Western blot; z-VAD-fmk, z-Val-Ala-Asp(OMe)-fluoromethyl ketone. Everett, H., G. McFadden. 1999. Apoptosis: an innate immune response to virus infection. Trends Microbiol. 7: 160-165. Hsu, L. C., J. M. Park, K. Zhang, J. L. Luo, S. Maeda, R. J. Kaufman, L. Eckmann, D. G. Guiney, M. Karin. 2004. The protein kinase PKR is required for macrophage apoptosis after activation of Toll-like receptor 4. Nature 428: 341-345. Kaiser, W. J., M. K. Offermann. 2005. Apoptosis induced by the Toll-like receptor adaptor TRIF is dependent on its receptor interacting protein homotypic interaction motif. J. Immunol. 174: 4942-4952. Han, K. J., X. Su, L. G. Xu, L. H. Bin, J. Zhang, H. B. Shu. 2004. Mechanisms of TRIF-induced ISRE and NF-κB activation and apoptosis pathways. J. Biol. Chem. 279: 15652-15661. Gil, J., J. Alcami, M. Esteban. 1999. Induction of apoptosis by double-stranded-RNA-dependent protein kinase (PKR) involves the α subunit of eukaryotic translation initiation factor 2 and NF-κB. Mol. Cell. Biol. 19: 4653-4663. Alexopoulou, L., A.C. Holt, R. Medzhitov, R. A. Flavell. 2001. Recognition of double-stranded RNA and activation of NF-κB by Toll-like receptor 3. Nature 413: 732-738. Scarim, A. L., M. Arnush, L. A. Blair, J. Concepcion, M. R. Heitmeier, D. Scheuner, R. J. Kaufman, J. Ryerse, R. M. Buller, J. A. Corbett. 2001. Mechanisms of β-cell death in response to double-stranded (ds) RNA and interferon-γ: dsRNA-dependent protein kinase apoptosis and nitric oxide-dependent necrosis. Am. J. Pathol. 159: 273-283. Robbins, M. A., L. Maksumova, E. Pocock, J. K. Chantler. 2003. Nuclear factor-κB translocation mediates double-stranded ribonucleic acid-induced NIT-1 β-cell apoptosis and up-regulates caspase-12 and tumor necrosis factor receptor-associated ligand (TRAIL). Endocrinology 144: 4616-4625. Kaiser, W. J., J. L. Kaufman, M. K. Offermann. 2004. IFN-α sensitizes human umbilical vein endothelial cells to apoptosis induced by double-stranded RNA. J. Immunol. 172: 1699-1710. Lacour, J., F. Lacour, A. Spira, M. Michelson, J. Y. Petit, G. Delage, D. Sarrazin, G. Contesso, J. Viguier. 1980. Adjuvant treatment with polyadenylic-polyuridylic acid (Polya.Polyu) in operable breast cancer. Lancet 2: 161-164. Khan, A. L., S. D. Heys, O. Eremin. 1995. Synthetic polyribonucleotides: current role and potential use in oncological practice. Eur. J. Surg. Oncol. 21: 224-227. Salem, M. L., A. N. Kadima, D. J. Cole, W. E. Gillanders. 2005. Defining the antigen-specific T-cell response to vaccination and poly(I:C)/TLR3 signaling: evidence of enhanced primary and memory CD8 T-cell responses and antitumor immunity. J. Immunother. 28: 220-228. Fujita, H., A. Asahina, H. Mitsui, K. Tamaki. 2004. Langerhans cells exhibit low responsiveness to double-stranded RNA. Biochem. Biophys. Res. Commun. 319: 832-839. Matsumoto, M., S. Kikkawa, M. Kohase, K. Miyake, T. Seya. 2002. Establishment of a monoclonal antibody against human Toll-like receptor 3 that blocks double-stranded RNA-mediated signaling. Biochem. Biophys. Res. Commun. 293: 1364-1369. Yamamoto, M., S. Sato, H. Hemmi, K. Hoshino, T. Kaisho, H. Sanjo, O. Takeuchi, M. Sugiyama, M. Okabe, K. Takeda, et al 2003. Role of adaptor TRIF in the MyD88-independent Toll-like receptor signaling pathway. Science 301: 640-643. Means, T. K., B. W. Jones, A. B. Schromm, B. A. Shurtleff, J. A. Smith, J. Keane, D. T. Golenbock, S. N. Vogel, M. J. Fenton. 2001. Differential effects of a Toll-like receptor antagonist on Mycobacterium tuberculosis-induced macrophage responses. J. Immunol. 166: 4074-4082. Micheau, O., J. Tschopp. 2003. Induction of TNF receptor I-mediated apoptosis via two sequential signaling complexes. Cell 114: 181-190. Hengartner, M. O.. 2000. The biochemistry of apoptosis. Nature 407: 770-776. Sun, Y., D. W. Leaman. 2004. Ectopic expression of Toll-like receptor-3 (TLR-3) overcomes the double-stranded RNA (dsRNA) signaling defects of P2.1 cells. J. Interferon Cytokine Res. 24: 350-361. Jiang, Z., M. Zamanian-Daryoush, H. Nie, A. M. Silva, B. R. Williams, X. Li. 2003. Poly(I-C)-induced Toll-like receptor 3 (TLR3)-mediated activation of NFκB and MAP kinase is through an interleukin-1 receptor-associated kinase (IRAK)-independent pathway employing the signaling components TLR3-TRAF6-TAK1-TAB2-PKR. J. Biol. Chem. 278: 16713-16719. Suzuki, N., S. Suzuki, G. S. Duncan, D. G. Millar, T. Wada, C. Mirtsos, H. Takada, A. Wakeham, A. Itie, S. Li, et al 2002. Severe impairment of interleukin-1 and Toll-like receptor signalling in mice lacking IRAK-4. Nature 416: 750-756. Picard, C., A. Puel, M. Bonnet, C. L. Ku, J. Bustamante, K. Yang, C. Soudais, S. Dupuis, J. Feinberg, C. Fieschi, et al 2003. Pyogenic bacterial infections in humans with IRAK-4 deficiency. Science 299: 2076-2079. Bannerman, D. D., J. C. Tupper, R. D. Erwert, R. K. Winn, J. M. Harlan. 2002. Divergence of bacterial lipopolysaccharide pro-apoptotic signaling downstream of IRAK-1. J. Biol. Chem. 277: 8048-8053. Balachandran, S., P. C. Roberts, T. Kipperman, K. N. Bhalla, R. W. Compans, D. R. Archer, G. N. Barber. 2000. α/β Interferons potentiate virus-induced apoptosis through activation of the FADD/caspase-8 death signaling pathway. J. Virol. 74: 1513-1523. Stewart, W. E., Jr, E. De Clercq, A. Billiau, J. Desmyter, P. De Somer. 1972. Increased susceptibility of cells treated with interferon to the toxicity of polyriboinosinic-polyribocytidylic acid. Proc. Natl. Acad. Sci. USA 69: 1851-1854. Tanaka, N., M. Sato, M. S. Lamphier, H. Nozawa, E. Oda, S. Noguchi, R. D. Schreiber, Y. Tsujimoto, T. Taniguchi. 1998. Type I interferons are essential mediators of apoptotic death in virally infected cells. Genes Cells 3: 29-37. Chin, Y. E., M. Kitagawa, K. Kuida, R. A. Flavell, X. Y. Fu. 1997. Activation of the STAT signaling pathway can cause expression of caspase 1 and apoptosis. Mol. Cell. Biol. 17: 5328-5337. Takaoka, A., S. Hayakawa, H. Yanai, D. Stoiber, H. Negishi, H. Kikuchi, S. Sasaki, K. Imai, T. Shibue, K. Honda, et al 2003. Integration of interferon-α/β signalling to p53 responses in tumour suppression and antiviral defence. Nature 424: 516-523. Janicke, R. U., M. L. Sprengart, M. R. Wati, A. G. Porter. 1998. Caspase-3 is required for DNA fragmentation and morphological changes associated with apoptosis. J. Biol. Chem. 273: 9357-9360. Laplanche, A., L. Alzieu, T. Delozier, J. Berlie, C. Veyret, P. Fargeot, M. Luboinski, J. Lacour. 2000. Polyadenylic-polyuridylic acid plus locoregional radiotherapy versus chemotherapy with CMF in operable breast cancer: a 14 year follow-up analysis of a randomized trial of the Federation Nationale des Centres de Lutte contre le Cancer (FNCLCC). Breast Cancer Res. Treat. 64: 189-191. Lacour, J., F. Lacour, B. Ducot, A. Spira, M. Michelson, J. Y. Petit, D. Sarrazin, G. Contesso. 1988. Polyadenylic-polyuridylic acid as adjuvant in the treatment of operable breast cancer: recent results. Eur. J. Surg. Oncol. 14: 311-316.